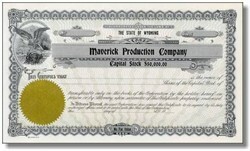 Beautifully engraved unissued stock Certificate from the Maverick Production Company . This historic document was printed by the Goes Banknote Company and has an ornate border around it with a vignette of a flying eagle. This is an unissued certificate and you can fill in the blanks and give it away as a gift.